Musharraf urged the nation not "to lose courage"
Pakistani leader Pervez Musharraf has vowed to "cleanse the country of extremists" after narrowly surviving an assassination attempt on Thursday. At least 14 people were killed in two huge blasts in the Pakistani city of Rawalpindi, minutes after the presidential motorcade passed by. 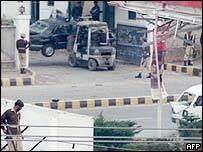 In a TV interview just hours after the attack, General Musharraf blamed Islamic militants for the attack. He said he was now even more determined to fight terrorism in Pakistan. It was the second attempt on his life in 11 days. Last week, General Musharraf was unscathed when a bomb blew up a bridge seconds after his convoy had crossed it in Rawalpindi, just outside the capital, Islamabad. The BBC's Paul Anderson in Islamabad says militants, who were blamed for last week's attack, are angry at General Musharraf's support for the United States in its fight against al-Qaeda and the Taleban. Several months ago the number two in the al-Qaeda network, Ayman al-Zahwari, put out a videotape urging Pakistanis to overthrow Mr Musharraf. "We are fighting a war against terrorism," General Musharraf told state television. Looking calm and composed, he blamed "extremists and terrorists who want damage the country, [and] defame the religion". "We have to face them and we will not lose courage," he said. He admitted that he had "quite a narrow escape" earlier on Thursday, when three vehicles in the presidential motorcade were hit by two truck bombs detonated by suicide bombers. The windshield of the president's armoured Mercedes was slightly damaged, Major General Sultan told BBC World television. Dozens of people were wounded in Thursday's explosions, and witnesses said they saw body parts at the site. "The president's motorcade had just passed and about half a minute later the explosion went off," one eyewitness told Pakistan's Geo television. Several cars were destroyed and windows of nearby buildings shattered. In one of the blasts, a suicide bomber reportedly rammed a pick-up truck into a police vehicle. The explosions took place close to the site of last week's failed assassination bid. High-tech jamming devices were said to have delayed last week's blast until after the president's motorcade had passed. 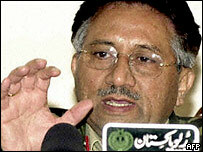 General Musharraf will also give up some of the powers he assumed after his bloodless coup in 1999. Under the agreement, General Musharraf remains as president but will have to seek Supreme Court approval if he wants to sack the government. "Most people here... are pointing the finger at people who would have sympathies with the Taliban"